She lived much of her life in pain, and with an appearance that might’ve seemed cockeyed to some. 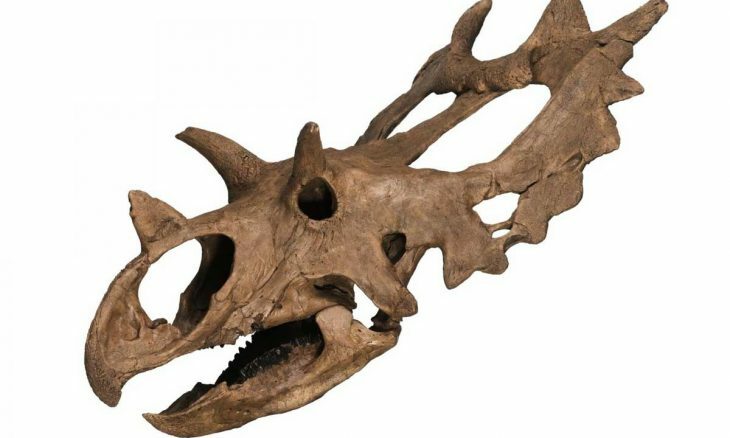 Discovered a decade ago eroding out of a hillside in Montana, the fossil includes most of the animal’s skull, hips, and legs, providing a detailed view not only of a new genus of dinosaur but also of one ancient animal’s intimate life history. “This is a spectacular new addition to the family of horned dinosaurs that roamed western North America between 85 and 66 million years ago,” said Dr. Jordan Mallon, paleontologist with the Canadian Museum of Nature, in a press statement. The dinosaur appeared in a stratum of earth dating back 76 million years, Mallon noted, when the windswept prairie of central Montana was a balmy floodplain. Judging by her appearance, Judith turned out to represent an important phase in the evolutionary development of the continent’s northern horned dinosaurs. 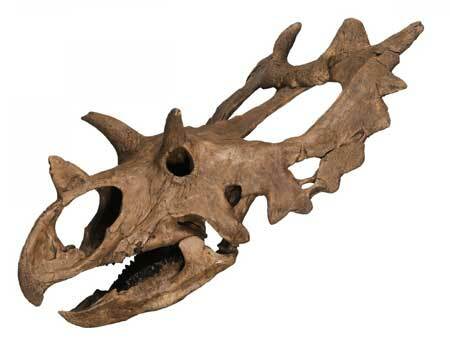 First, the horns over her eyes stick out laterally from the sides of her skull, an unusual look even for a ceratopsid. What’s more, the frill that framed her face was studded with spikes, some of which curve forward, while others sprout straight out. 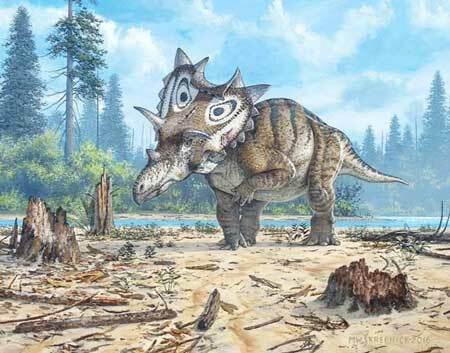 “In this sense, Spiclypeus is transitional between more primitive forms, in which all the spikes at the back of the frill radiate outward, and those such as Kosmoceratops in which they all curl forward,” Mallon said. He and his team pointed out that Spiclypeus is at least the ninth genus of dinosaur to be discovered in Montana’s Judith River Formation — some of which have been found farther north, like in Alberta, but none of which appear in the fossil record to the south. But the fossil has yielded insights about the individual animal herself, as well as about dinosaur life in general at the end of the Cretaceous. The study of Judith’s remains revealed that her left humerus, or front arm or leg bone, showed signs of arthritis and osteomyelitis, or infection of the bone tissue. The condition appeared to have been severe enough, Mallon added, that the pain it caused likely cost Judith the use of her left front leg. “If you look near the elbow, you can see great openings that developed to drain an infection,” Mallon said. In the end, the story of Spiclypeus adds one more chapter to the continually unfolding narrative of natural history in the Judith River Formation, Mallon said. “It provides new evidence of dinosaur diversity during the Late Cretaceous period from an area that is likely to yield even more discoveries,” he said. Mallon and his colleagues report their findings in the online journal PLOS One.